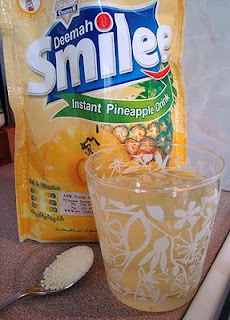 I wanted to share a real find with you - Son and I were at our local Lebanese grocers (at the Mawson shops, for locals) the other day, and he spotted these packs of Deemah Smilee drink mix. It comes in pineapple and mango flavours. So - in the spirit of always liking to try new foods and drinks from other lands - we got a pack of each. The powder mixes up in water a bit like Tang, but is much less sweet, and the flavour is really good. The pineapple one tastes closer to freshly juiced pineapple than tinned pineapple juice, and the mango one is refreshing as well. A $3 bag makes 6 litres of drink. It's also great sprinkled on plain yoghurt or ice cream! I can see this will become a regular addition to our pantry! 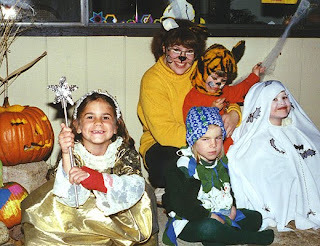 This is me and the kids (Dotter as Baby Tiger, and Son as a Friendly Ghost) with some young French friends in Boulder CO, when we lived there in the mid-1990s. 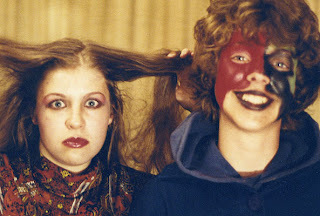 The kids loved Halloween then, and I admit I loved the chance to dress up as well! I've been interested to see that this year there's been a huge increase in Halloween paraphernalia in the shops. Plastic pumpkin buckets, packs of individually packaged lollies, witches hats, masks, window decorations, the lot! Shops even have "Halloween displays" in prominent positions, a real rarity (yeah, next to the Christmas decorations which are out already, bleah). I don't have an issue with this - apart from it being the wrong bloody season for the festival (we have Easter in autumn, and Halloween in spring, gah). Halloween, while at its most commercial and popular in the States, originated in Scotland, as All Saint's Day over 1300 years ago, in the 700s, and spread through Britain first, before eventually being exported to the New World by Irish immigrants in the 1800s. It is celebrated around the world in many different guises, but has never really taken off in Australia - maybe because of the season mismatch, or a mistaken reaction against an 'American' holiday? ha! Love that photo of you in 1980! I thought I was looking at Jen at first! Very clever to go with grapefruits! I have no problem with the concept of halloween as an ancient pagan festival and totally get the harvest festival part of it - I have no actual connection to it as a late October over the top holiday though! I'm not anti it - i just don't connect with the representation of it as an American thing. Just didn't grow up with it. Yes, agree with Bells - Dotter looks so much like you, amazing! 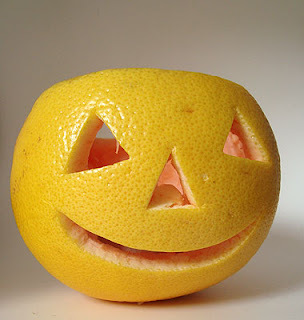 And great idea to use grapefruit instead of pumpkins! I'm not a huge fan of celebrating halloween here, but it's getting inevitable! My daughter is cracking to get involved with Halloween this year because she has a friend that does it every year and she has been invited to go with her .. she is nearly driving me nuts with insisting we go to Spotlight, Lincraft and anyone else that is stocking Halloween garb. I wished you lived in my street. She'd love your place at Halloween. I understand that in England they carve turnips (which sounds really difficult to me). I love the grapefruits! We bought our pumpkin yesterday and always have a family dinner on Hallowe'en. I love it. Any excuse to dress funny and have a party. I always THOUGHT Haloween came at the wrong time of year! It's cold and wet and windy, and your awesome costume is hidden under your rain gear or your heavy coat. How MUCH more intelligent to arrange for a mild spring evening to go trick-or-treating! A goose? Your dad was an artist! 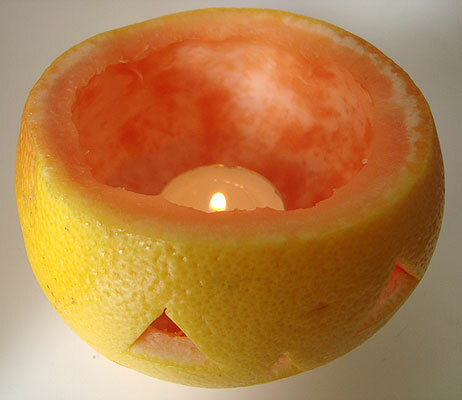 Carving a grapefruit = genius! I want to carve something but even here in autumn, the price of pumpkins is ridiculously high this week. The grapefruit is an awesome idea, even to someone who lives down the road from a farm stand with pumpkins. One year when the pumpkin crop was terrible (lots of rain at the wrong time, and they rotted in the fields), I bought an acorn squash and carved it. It was cuuuuute! Come in for a cuppa!